Code Quality is a big issue. StyleCop is a tool from Microsoft (an open Source Tool btw.) to analyse the Source Code. In contrast to FxCop or Code Analysis from VSTS it controls the code for observation the Codeing Conventions etc. Here a blogpost to show you the diference. 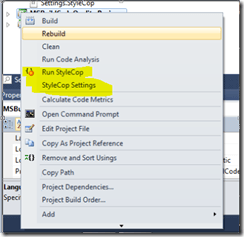 Anyway it´s quite easy to integrate StyleCop into your MSBuild and use it this way in your Build Process. StyleCop - I installed Version 4.4.0.14 RTW. 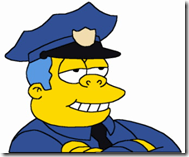 You have the opportunity to open Stylecop in MSBuild without any other tools but in my opinion that´s not the classy way and you don´t have so many options. Take a look on this post from the StyleCop Team. I´ve downloaded MSBuild Extension Pack August 2010 Files. In this Zip directory we only use the "MSBuild.ExtensionPack.Binaries 4.0.1.0". Now we need to copy some files from both folders. In the folder "Lib" you will find 3 dlls from the StyleCop folder and the other 2 Files are from the ExtensionPack,Binaries folder. Please copy these files into one directory. Click on "run StyleCop" and the StyleCop file is passed to the project directory. 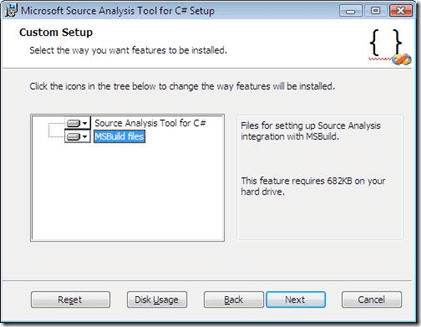 There is a Target "Measure" in the MsBuild File and we are going to import the MSBuild Extension Pack File. After this we copy all .cs files from line 10. 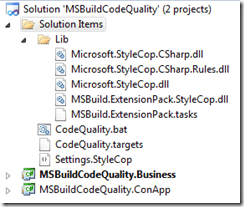 At least we open the MSBuild Extension Pack Stylecop. For return there is a bool named "Succeded" and a counter. With the help of a .bat file we open the MSBuild file. As result we have a logfile+XML file with all the warnings. It´s easy to attend this file afterwards. Actually I just tested this "local" but there exist integrations in Hudson and TFS.